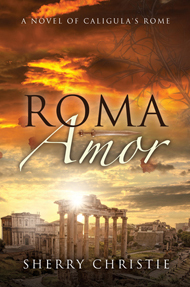 Marcus Carinna isn’t happy when his father orders him to leave the army life behind and come back to Rome and befriend the new Caesar Caligula. Three years ago Marcus’ brother (and Caligula’s best friend) committed suicide after charged with treason and Marcus hasn’t forgiven his father that he let it happen. It’s after he becomes Caligula’s friend he starts to unravel old family secrets. I liked Marcus who was so devoted to learning the truth about his brother’s death. He had earned quite a reputation in Rome but seemed committed to reforming his name and to live up to his father’s expectations. When Marcus develops an interest in the Marcomanni Priestess called Aurima, his father is less than pleased. In the end, I really loved this and it was quite a quick read too.